Set of pink ribbon foldover note cards. Flat printed in typestyle and ink color only as shown. Size 5.5" x 4.25". Blank envelopes included. Printed return address in flat black ink available. Optional..
Includes 150 loose sheets with pink ribbon design in a clear acrylic holder. Personalized in flat black ink tied with a pink grosgrain ribbon. Size of memos is 4.125" x 6.438". 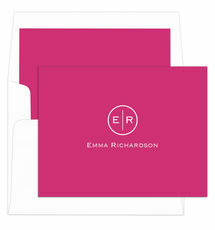 Typestyle..
Set of pink ribbon flat note cards. Flat printed in typestyle and ink color only as shown. Size 6.25" x 4.5". Blank envelopes included. Printed return address in flat black ink available. Optional hot.. Exclusive to The Stationery Studio. 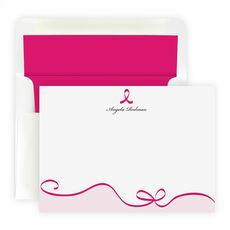 A perfect set of return address labels to show your support for the fight against Breast Cancer. Sized 2" in diameter. Flat printed on white glossy stock with.. Showing that you support a loved one afflicted by breast cancer is easy when you shop for breast cancer awareness gifts. We offer thoughtful gift ideas for home, office or on the go, and you'll find something perfect. Some specialty items that we can personalize include memos and notepads, sticky notes and note cards and many feature the pink ribbon design. 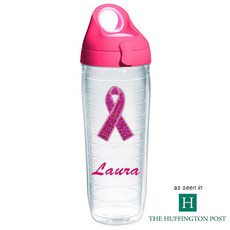 Our Tervis tumblers and water bottles also make fantastic gifts, feature the pink ribbon and a name, and come in a variety of sizes. The water bottles, which have a quick release lid, are great for staying hydrated while taking daily walks, longer hikes, or at the gym and feature a name or initials.